It has been getting coooold lately, cold for Southern California anyways! This is perfect weather for you to cook up some soup. If you haven’t built up the courage to try the bitter melon soup I posted the other week, Vietnamese chicken soup with elbow macaroni might be a simpler start :). What’s that you say? Elbow macaroni isn’t Vietnamese?…hmm. You’re right, you’d probably never find this soup served in Vietnam or in any Vietnamese restaurants. 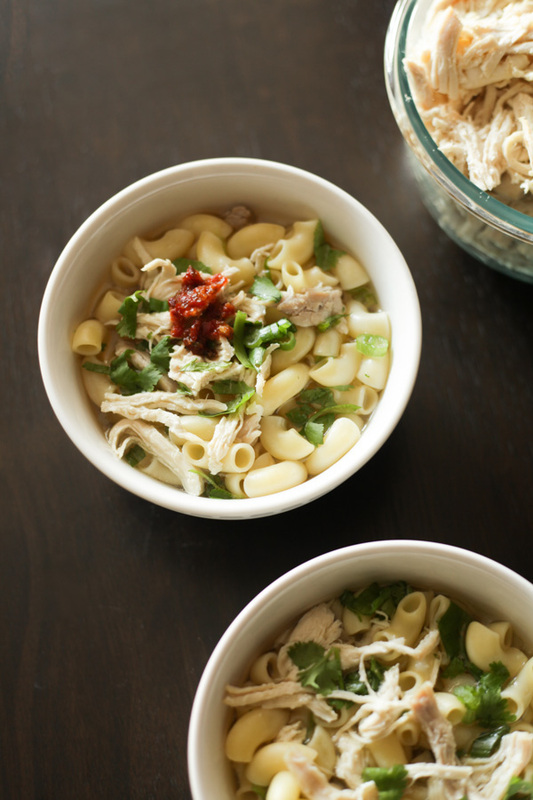 This is strictly some homemade chicken soup you’ll find in Vietnamese-American homes. This is another dish I grew up with as a kid, and I was so excited whenever mom or grandma was making it! 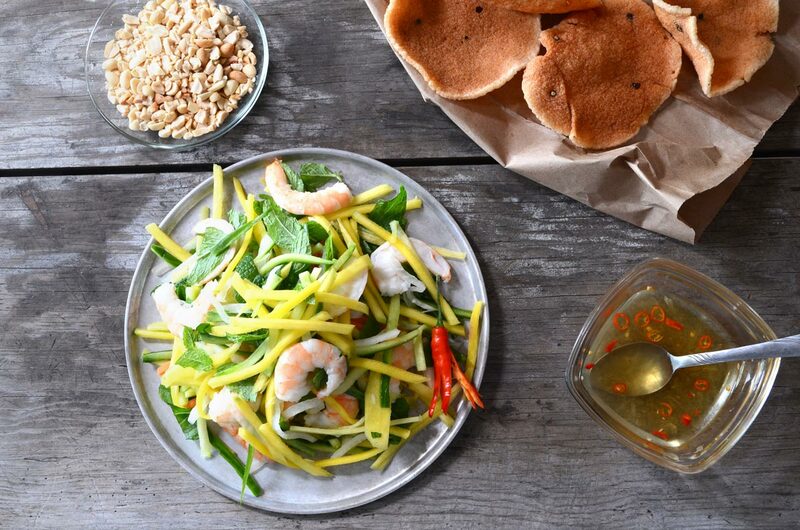 In the original Vietnamese version of this, you’d use mung bean noodles instead–the macaroni is simply a switch made out of convenience in the US and it tastes great too! I think this soup is an easy sell for those not yet comfortable with Vietnamese cuisine. It’s incredibly simple, fairly tame (no weird bits), and not too far a stretch from American chicken noodle soup. 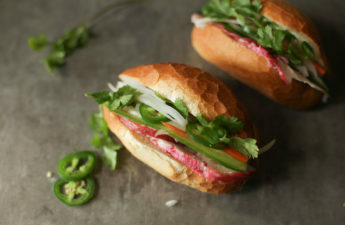 The few hints of Vietnamese especially come through here with the addition of cilantro, scallion, and a smidge of sambal for kick. This is one of those simple foods you can make a big ol’ pot of and eat for a week. Simple food like this soup is always very humbling to me. Let’s take a second and think about how fortunate we are to have food. How fortunate we are to have options at all. I have it on good authority (mom :)) that many of the folks in Vietnam grew up incredibly poor. Consider this–it’s common to have under 1/4 pound of meat shared between an entire family for a meal, if you were fortunate to have meat at all! Meanwhile in America, we have the option of things like ‘Quarter Pounders,’ ‘Double-Doubles,’ and all you can eat BBQ! If you cooked at home each week, you really could pay for a whole month’s worth of food with 1 day’s worth of pay. The super-poor in Vietnam work their butts off for an entire month and still are forced to eat just rice with fish sauce. I’m sure I was told some version of that repeatedly as a child, but it was never processed. But yes, I’m fortunate and thankful for it! Choose chicken with bones and darker meat for better flavor. The more chicken you use to make the broth, the better it’ll taste! The only problem you’ll have is a ton of leftover chicken. You can use leftover boiled chicken to make Vietnamese chicken salad (goi ga), or bun thang (another Viet rice noodle soup)—recipes coming soon! 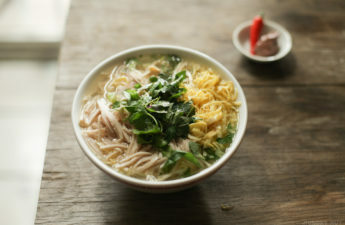 Anyway, here’s how to make some of that humbling, Vietnamese chicken soup! 1 large yellow or white onion (or 2 medium sized onions), quartered. Add chicken, onion, salt, sugar, and MSG into a large pot. Add enough water to cover, bring to a boil, then reduce to a simmer. It should take about 10-15 minutes of simmering to finish. Meanwhile, boil your macaroni in a separate pot of water until al dente, then drain. Check the doneness of the chicken as each 1-2 minutes pass. The chicken should be white in the center and have the juices run clear. Adjust seasoning as needed. Remove chicken, let it cool, then pull into shreds with your fingers or a fork. 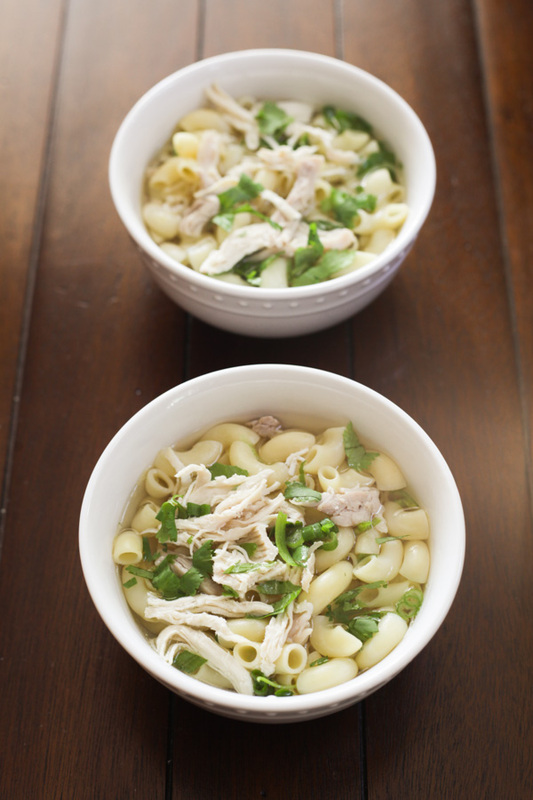 Add to a bowl macaroni, some broth, chicken, and garnish with chopped cilantro and scallion. Top with sambal and serve! Wow! 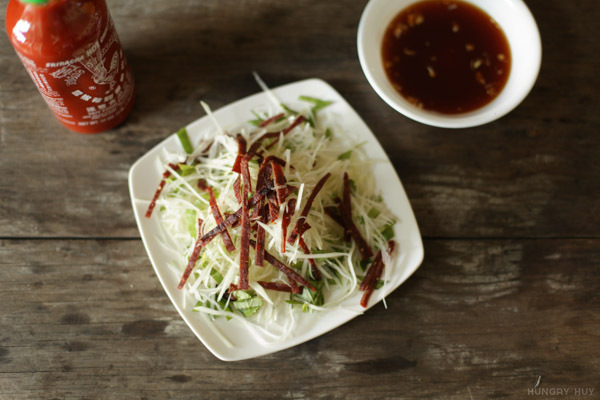 Your website is a gold mine of Vietnamese-American recipes!!! These are the foods, values, and stories that I grew up on with my own grandmother…almost exactly. By the time I appreciated the richness and value in my grsndmother’s cooking, I had moved too far away to really learn from her. Thanks for sharing! Hey Theresa, I’m glad you enjoy the recipes here and thanks for commenting! I really do wish I paid more attention when grandma cooked so often way back when. Sometimes it’s difficult to know what you’re missing out on until it’s gone right? It makes me stop to think about and appreciate everything that’s here now as well. Whoa!! You win the Internet today! I’ve been looking for this recipe forever! I was beginning to think only my mom made this since various youtubers and popular Vietnamese blogs/sites had every doggone (repetitive) soup/stew recipe, but this one. I loved eating this as a kid and have been craving it as an adult. BTW, thanks for adding the traditional MSG. I know people are freaks about it, but if it’s good enough for grandma (not to mention the millions and billions who’ve used it throughout the decades…and still use it now — Doritos, anyone? LOL), it’s good enough for me. LOL! Besides, it’s an optional ingredient for those whom don’t care for it for whatever reasons. I’m all about authenticity and tradition. I know how to add/remove ingredients for my own palate or supposed health (if I choose). Thank you so much for posting a humble, everyday recipe. I hope to see more in the future such as the tomato-based soups with thin slices of beef, the omelet with ground pork, etc. Hangeroo, that is quite the prize :). I wanted to post it because it’s something I loved to eat. Since it might be too simple to sell in a restaraunt, maybe being forced to cook it at home is a win. Also yeah the MSG improves the flavor. Sometimes people can tell if it’s not present, and not know it was the MSG. Doritos…lol, where would the snack food industry be without it? I think I’m blind but I don’t see how much water to cook the chicken in? Is it just enough to cover the chicken or an exact amount? Yep Kim, its just enough to cover the chicken so this will change depending on the size of your pot. This is why in step 3 you’ll have to taste it and adjust the seasoning until it tastes good to you. Let me know if you have more questions! Thanks for the recipe Huy (that’s my little brother’s name). My mom made this for us growing up and I’ve been meaning to ask her for the recipe. I was naïve to think she this was her own concoction. 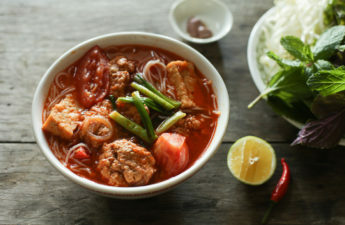 I would love for you to tackle “bun rieu” one of my favorite soups! Thank YOU for checking out my recipe! Despite it not being her recipe, somehow the way mom makes it tends to be irreplaceable :). And you know what? 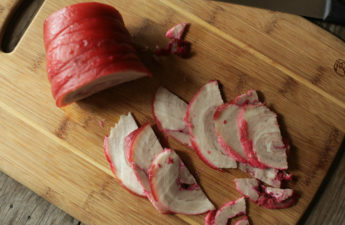 My bún riêu post is already underway! If you’re not already, subscribe to my e-mail list so you don’t miss when it’s published. Take care! I used to think only my uncle made this, I cant believe I found this recipe! Btw we are in Australia, so you could say it’s Vietnamese-Australian too! 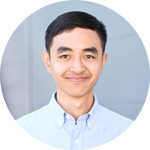 Hey Huy! Did your mom or grandmother ever make rice soup for you? Mine makes this rice soup that she ‘says’ is so simple to make. She claims it only has shredded chicken, rice and black pepper in it, but I swear it tastes more complex than that! Would love to find a recipe for it if you have one. Thanks for all the great recipes! I keep finding more and more recipes that I just have to try. I’m going to make a few for my mom as a surprise for her! Wish me luck! Hey Christi! Yes, I believe you’r talking about cháo! It is very simple to make. My paternal grandma just made it a few weeks ago after Thanksgiving. Add turkey/chicken bones into a pot with an onion, fresh ginger, rice, water and season with fish sauce. Dinner for a week!